John A’Bear was an outstanding lock forward and successful captain of Gloucester who played 167 games for the club from 1933 until 1939. He was still only 25 when WW2 curtailed his career, although he played a further 44 games during the first years of the war until fixtures were suspended. He played for Gloucestershire from 1935-39, playing in the County Championship winning team of 1936-37. In 1937-38, at the age of 24, A’Bear became the club’s youngest Captain. He also captained the club the following season. During his first year of captaincy the club recorded 29 wins out of 36 matches. John Gordon A’Bear was born in Cheltenham on 16 July 1913. He was educated at The Crypt School Gloucester where he learned his rugby. 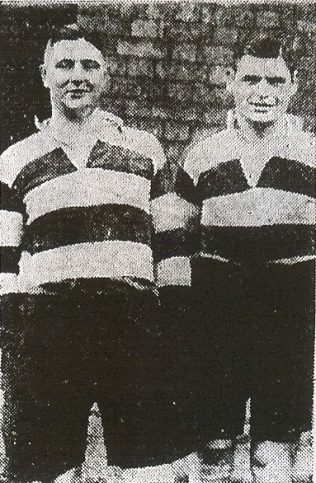 A’Bear had lined up at St Helens alongside Roy “Digger” Morris at lock and so started the second row partnership of Digger Morris and John A’Bear that was to be one of the great strengths of Gloucester during the period. John was best man at Digger Morris’s wedding and together they would provide after-match entertainment with their version of “The Pig Song”. John A’Bear was surprisingly quick for a lock and a dynamic player in the loose, although at times he ran the inevitable risk of getting isolated. He scored 24 tries in his Gloucester career. 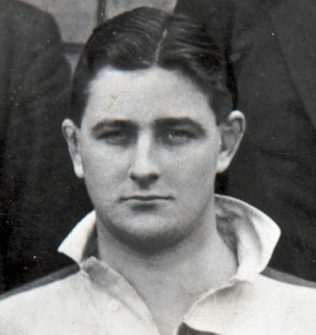 He played for Gloucester in the first two years of WW2 and also played for representative sides, including an appearance for a British Empire XV against the West of England at Bristol, one of the big matches of the 1940-41 season, but he didn’t resume his playing career after the war, retiring in 1946 due to business commitments. John A’Bear died in January 1979. Does anyone know the lyrics to this famous ‘pig song’? I did an internet search and found a few songs about pigs but none that seemed to warrant such fame. I hope the lyrics are printable!